Not literally! 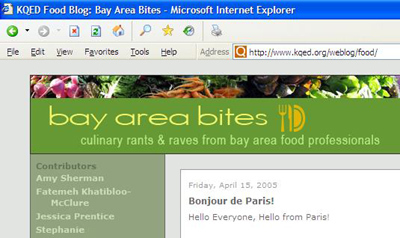 The Bay Area, the San Francisco Bay Area that is, actually rocks, and even more so with this cool new culinary blog, Bay Area Bites, courtesy of KQED, the local PBS station. I am so excited that I am now one if their contributing "bloggers" (hate that name but if the proverbial shoe fits...) and hopefully providing an interesting perspective of culinary life in France. Click here to see my first story about cooking at Chateau de Villette (of The Da Vinci Code fame) just outside of Paris. I'll be posting on Fridays so please stop by and see what life has stirred up on this side of the pond. How very exciting! Looking forward to seeing your Friday entries. I have finally subscribed to this blog with my bloglines. I'll see when you post!